There were 2 recipes provided for this challenge - I chose Y's recipe for the gingerbread and used a simple sugar syrup for assembling. Preparation Time for Y's Recipe: 5-10 minutes to mix the dough, 2 hours to chill, 5 minutes to roll, 10 to cut and 15 minutes to bake. Estimated 4-7 hours from start to finish including chilling. 1. Everything needs to be edible - no glue or inner non-food supports allowed. 2. You must bake the gingerbread yourself, whichever recipe you choose. No graham cracker houses please! 3. You must use some sort of template. If you don't use ours, take a picture or link to what you do use in your final post. It doesn't have to be super technical - Anna didn't even measure hers, she just cut out shapes from parchment and made sure the edges matched up. 4. Your house must be able to stand on its own. If you want to go adding balconies with candy stick buttresses or whatever go right ahead, but the main house itself must be free-standing. Variations: You are welcome to use either recipe we tested, depending on your taste or what is available where you are. 1. In a large bowl, cream the butter and sugar until blended. Add the cinnamon, ginger and cloves. Mix the baking soda with the boiling water and add to the dough along with the flour. Mix to make a stiff dough. If necessary add more water, a tablespoon at a time. Chill 2 hours or overnight. 2. Cut patterns for the house, making patterns for the roof, front walls, gabled walls, chimney and door out of cardboard. 3. Roll the dough out on a large, ungreased baking sheet and place the patterns on the dough. Mark off the various pieces with a knife, but leave the pieces in place. 5. Preheat the oven to 375'F (190'C). Bake for 12 to 15 minutes until the cookie dough feels firm. After baking, again place the pattern on top of the gingerbread and trim the shapes, cutting the edges with a straight-edged knife. Leave to cool on the baking sheet. Place in a small saucepan and heat until just boiling and the sugar dissolves. Dredge or brush the edges of the pieces to glue them together. If the syrup crystallizes, remake it. The December 2009 Daring Cooks Challenge was hosted by Simone of Junglefrog Cooking. 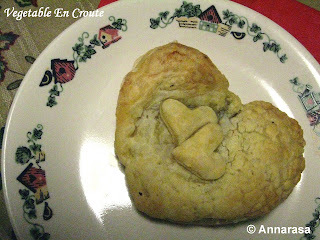 Simone chose Salmon en Croute (or alternative recipes for Beef Wellington or Vegetable en Croute) from Good Food Online. I made one with stir fried button mushrooms, fresh herbs, and a jalapeno jack cheese-cream cheese blend! Here you go. I found this quite similar to the Savoury Vegetable Puffs that I made last December. A firm favourite with diners in many an Indian cafe, I have also found the latter to be more spicy and will go well with a cup of sweet tea. The Vegetable en Croute on the other hand is defiantly main course and would go well with a green salad or a simple soup like my Watercress & Potato Soup. Heat the oven to 200°C/390 F. Put the cream cheese in a food processor with the watercress, spinach and rocket and whizz the lot until you have a creamy green puree. Season well. Cut the pastry in any shape desired, 2 per patty, so you can wrap the vegetable and sauce in it completely (approx. 2-3 mm thick) and lay it on a buttered or oiled baking sheet (it will hang over the edges). Put the mushrooms in the middle. Spoon 2 tablespoons of the watercress mixture onto it. Sprinkle half the hard cheese. Place the second piece of cut pastry on top - press and seal. Trim off any excess as you need to. Using a fork, prick the pastry all over to allow steam to escape and make some decorations with the off-cuts to disguise the join if you like. Bake for 30 minutes or until the pastry is crisp and browned. Serve with a fresh green salad. I made 2 individual sized patties. Sift the flour into a large bowl, add the butter and rub in with your fingertips until the mixture resembles fine breadcrumbs. If you have a food processor you can use that as shown in the above video. Stir in the salt, then add 2-3 tbsp of water and mix to a firm dough. Knead the dough briefly and gently on a floured surface. Wrap in cling film and chill while preparing the filling. For best results make sure the butter is very cold. First, from Priya @ Priya's Easy N Tasty Recipes comes Vegan Cucur Kodok or the very delicious Malaysian Banana Fritters to the uninitiated!! Next comes Curry Puff from Usha Nandini @ Usha Nandini's Recipes. Usha Nandini notes that the Curry puff is a cousin of samosa from Malaysia, Thailand and Singapore. It is a "Fill-It-Yourself" snack due to its choices of wide varieties of fillings suitable to your taste. Jill @ Smart Green Gourmet writes, "Inspired by fellow bloggers Annarasa and D.K., I'm trying out some Malaysian cuisine this week as part of the A.W.E.D. (A World of Epicurian Delights) event hosted by Annarasa. Beautiful, flavorful Malaysia inspires a soup loaded with flu-fighting foods, the perfect quick fix cure for your change-of-seasons cold." 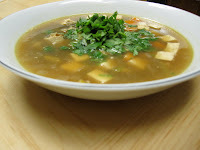 The soup in question is the Malaysian-Inspired Sweet and Sour Tofu Soup. Sudha @ Malaysian Delicacies sends in the very lovely looking Pressed Rice, Vegetable Stew with Groundnut Gravy . Beautiful rice dumplings steamed in banana leaves are served with a thin coconut milk gravy stew, and groundnut sauce!! Mmmm - you don't want to miss out on this one. 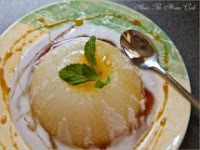 Alesia @ Alesia The Home Cook has made one of her favourite desserts for A.W.E.D Malaysia: Sago Gula Melaka. Alesia write that she loves this dessert as it is easy to make and it's not time consuming at all. Further the ingredients can be obtained at almost every Asian stores. This is a wonderful dish as it combines the tasteless yet springy sago with the fragrant coconut milk and the sweet aromatic gula melaka. Sweatha @ TastyCurryLeaf sends in Gendan Kasturi or Sweet Mung Bean Fritters made Malaysian style!! A very simple recipe with a very satisfying taste. 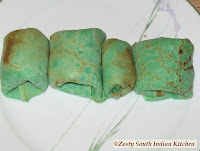 Swathi @ Zesty South Indian Kitchen sends in the delicious Kuih Dadar or Coconut Pancake! Swathi selected this dish because it resembles a breakfast dish common in her home town Kerala, India. She says this dish is usually popular in malls, food courts, and street vendors in the mornings or night. Needless to say Swathi is a big fan of street food which she quite rightly observes is often tastier that food at restaurants!! DK @ The Chef In You sends in her contribution with Roti-Canai. A flaky and soft albeit rich bread, this is a delicious recipe that DK explains in no less than 2 variations!! And finally one from yours truly!! 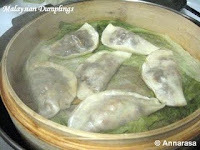 Steamed Malaysian Dumplings to be found @ my blog Annarasa - Essesence of Food. These are a family favourite and a regular at my home. Try them, you will love them. If your contribution is missing from this roundup, please email me and I will add your entry here pronto.